Let’s be honest: getting up off your couch and heading to the gym can be a difficult battle you face with yourself. Consistently feeling motivated to exercise daily doesn’t always happen, and some days you feel more driven to get in a good workout than others, especially when your soft, comfortable bed and your favorite Netflix series sound more appealing, and walking to the kitchen to get another snack seems to be a workout in and of itself. So how do we do it? How do we encourage and motivate ourselves to exercise when we can hardly muster the energy to bend our elbows? Today’s blog post is aimed at finding a solution to this universal toil. So before you lace up your sneakers, stay where you are. Get comfortable, relax into your couch, and read along as we list out some helpful tips and tricks to self-motivating. Before you know it, you’re going to be up and out of your house, sneakers securely strapped on, running to the gym to get in a solid workout. It’s so easy to sign up for a gym and bask in self-motivation for a few days…that is, until the feeling leaves and the gym slowly becomes a distant thought. 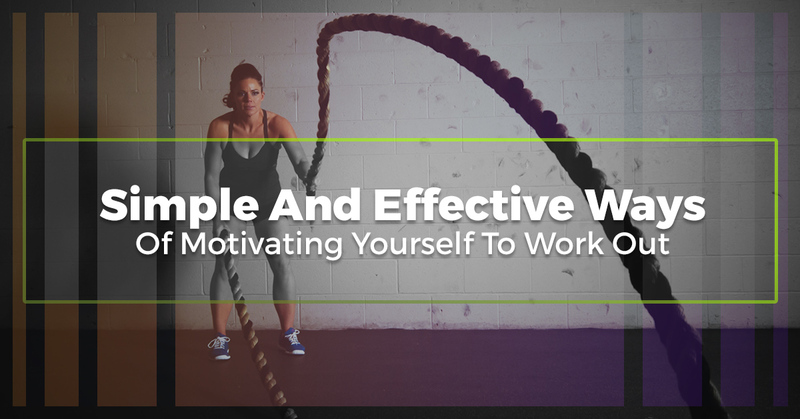 To combat the inconsistency of a fitness routine, we’ve listed out a few tips and tricks that will help you find the internal motivation you need to make some time at the gym a part of your weekly schedule. Putting these tips into practice will help you self-motivate, and soon enough, getting yourself to the gym won’t be such a trying time — in fact, you may even find yourself looking forward to your workout! Sometimes incentivizing yourself is the most effective way to get yourself into your fitness center and start working up a sweat. Placing vague goals in your mind, like “My incentive is a healthy body,” are helpful, but oftentimes, we need a tangible treat to reward ourselves for a job, or workout, well done. After every workout, treat yourself to a delicious smoothie. Following up a workout with a fruit or protein smoothie just might be what you need to finish your daily fitness routine, because you’ll know that is waiting for you afterward! You’re still getting a tasty treat while also being healthy about what you consume. Every day you go to the gym, place a couple of dollars aside to treat yourself to a massage or spa day. This is an excellent way of rewarding yourself for staying consistent with your fitness. After a few weeks, you’ll have the funds available to schedule a deep tissue massage or facial — both of which will help you relax and further benefit your body. Create a timeline for yourself, and after a few weeks or months of consistently making time in your schedule for exercise, purchase a new pair of sneakers for yourself. Having fresh workout gear is one of the best ways to motivate yourself to head to the gym and get moving. While making a mental commitment to ourselves is a great place to start, research shows that making a physical commitment with your close friends and family members is much more effective. Gather some friends or family who are also wanting to make exercise a part of their lives and write up a contract that states you are committing to a fitness lifestyle. By including your friends and family members, you’re more likely to stay committed to your goals. The accountability aspect is key when it comes to staying consistent with your fitness. Plus, you’ll have some people to workout with! We’ve discussed the benefits that come with hiring a personal fitness trainer in the past, and you can find further information about working with a trainer in this previous blog post. The main advantage of working with a personal trainer is that you’ll have a consistent time and space to work with a professional who will help you stay true to your weight loss and fitness goals. The accountability that personal trainers provide will further motivate you to get into the gym, even on days when you are not scheduled to meet. Fitness classes provide an excellent opportunity to hop off the treadmill or elliptical and switch up your workout. Plus, exercise classes can be fun! Here at Optimal Health Medical Fitness, we offer a variety of fitness classes, including boot camp interval training, one-on-one training, and partner training. Find more information online and by reading this blog post on the group classes we offer, and sign up for one today. Are you looking for a fitness center where you can work toward your weight loss, health, and personal fitness goals? Optimal Health Medical Fitness is here for you. Learn more about our facility and our fitness and regenerative medicine services, and schedule a consultation with our in-house doctor, Dr. Tariq, today.